Answer: To be honest, it also surprised me when I moved here in 1978. Yes, Arizona is a desert. At least in the southern half. You can see in the map above that the northern half is significantly elevated. A geologic structure called the Mogollon Rim (pronounced “moo-gee-on”) divides the state into two areas. The northern half is largely pine forest and sagebrush grassland, with alpine meadows around the mountains near Flagstaff. Average elevation is 2100 meters (7000 ft). Most of the southern half is part of the Sonoran Desert, which extends southward into Mexico. On this side of the Rim, the average elevation is 300 meters (1000 feet). Most of the year, both halves enjoy warm and dry prevailing winds from the WNW. But during the Summer, changes in the jet stream switch the prevailing wind to the SSE. Whereas the WNW winds blow from California and Nevada, the SSE winds blow up from the Gulf of California (aka Sea of Cortez) carrying moisture-laden air. It’s that SSE wind that brings the monsoon, though less so to northern Arizona. 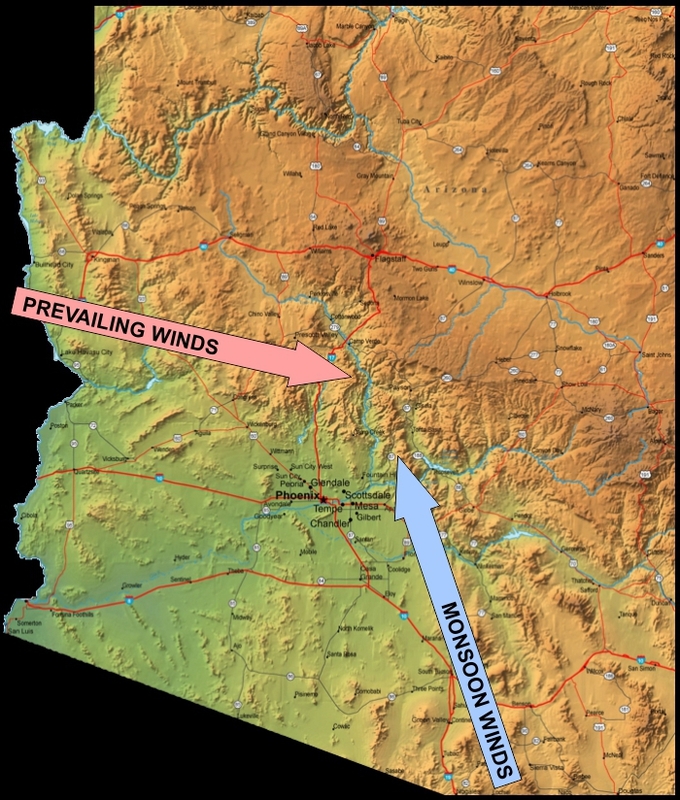 When that wind hits the Mogollon Rim, it rises and cools, dropping what remaining moisture it contains, and losing energy. On average, the monsoon starts July 7 and ends September 13. As you may have noticed, it started about a week early this year. 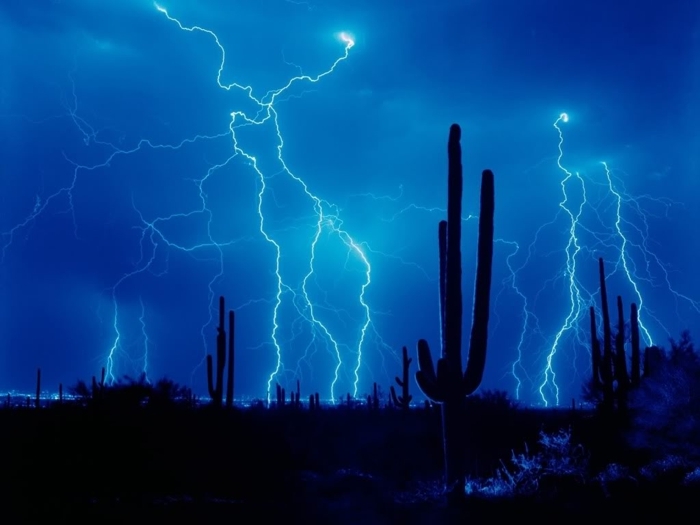 During the monsoon, Arizona gets most of its average 20 cm (8 inches) of rain. 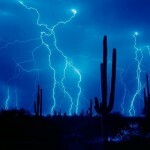 We also get some spectacular thunderstorms bringing lightning, and often haboobs. Click on the thumbnails below to see some monsoon action. 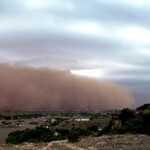 For a mind-bending video of a haboob engulfing downtown Phoenix, Arizona, see this 32 second time-lapse captured by Mike Olbinski on July 5, 2011. The speed-up factor looks to be around 10:1 — I’ve been caught in a few myself, so I’ve seen them up close. 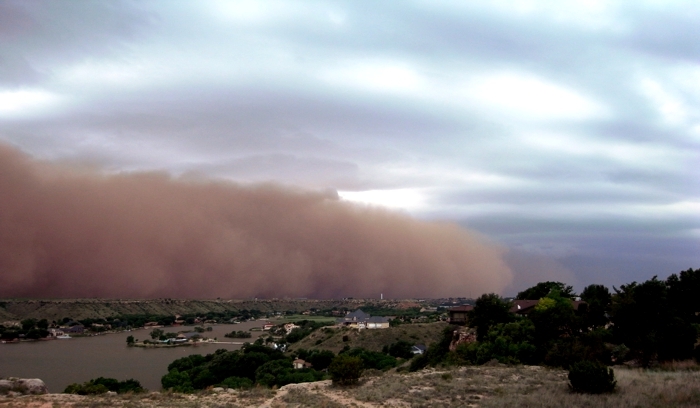 That advancing wall of dust can move at speeds from 50-80 kpr (30-50 mph).